Why would a Polish Jew fight for a Communist China alongside Mao Zedong? American filmmaker Ronald Levaco travels back to China, the country of his childhood, to discover what happened to an old family friend, “Eppy the Communist,” in Round Eyes in the Middle Kingdom. 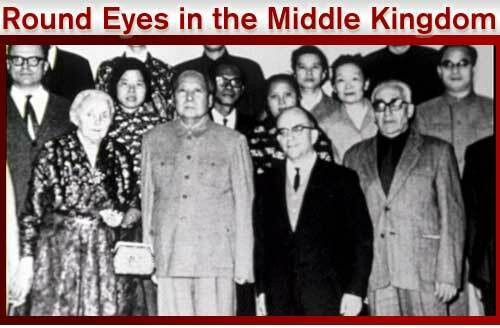 Round Eyes in the Middle Kingdom offers an insider’s look at Mao’s leadership and a history of the Cultural Revolution to which western audiences are rarely exposed. Both Epstein and Levaco’s father were raised in China, where they experienced the comfortable lifestyles afforded to wealthy western families before the Communists took over. But scenes of the nation’s poverty were inescapable: as a child, Epstein watched ordinary Chinese families, plagued by famine, sell off their children and die of starvation. These tragedies would haunt him in years to come and help form his politics. Most Westerners fled China before the revolution spread, Levaco’s family included. But Epstein felt connected to China and its citizens, and stayed behind to help work for a government that promised to take care of its people. The film paints a sympathetic portrait of Mao, explaining the controversial leader’s charismatic appeal. One of Epstein’s friends remembers of Mao that when he’d speak to an individual, he “focused every fiber of his being on you.” Epstein describes him as a Robin Hood figure, whose camp always had enough food for all of its members. It makes sense that a young idealist would be drawn to such a leader. And despite being imprisoned in solitary confinement for five years under suspicion of disloyalty because of his Western background, Epstein continued to believe in Mao’s China. It goes without saying that Epstein proves to be an individual of rare patience and endurance. Exuding a sense of calm and acceptance, Epstein has a slow smile and genuine nature that endears him to his friends. “When you meet someone that’s foreign, but looks like a little Buddah — that’s Eppy,” his good friend says, chuckling. Epstein explains how he’s come to accept the torture he endured, saying, all you have to do is “dissolve yourself of individual self-importance.” The resentment that someone could do this awful thing to you then fades away, he explains. Round Eyes takes its name from the Chinese nickname for foreigners. While the name refers literally to the sunglasses westerners wear, it also hints, figuratively, at the naiveté of the westerners who only dimly saw the country they were staying in. Most westerners lived in excess, socialized only with each other, and escaped famine and the revolution. Epstein was a rare exception.